Plot Summary: It seems that Lum's grandfather made an agreement that should he have a daughter, she would be married to a traveling merchant that he met. Now, the merchant has come to collect due. 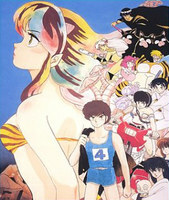 Ataru is tricked into thinking that Lum wants to leave, and so, in a moment of anger, says he hates her. Arguments erupt, and Lum decides that she must know the truth of Atarus feelings. As for all the questions of importance for the Onis, a game of tag begins, one that Ataru can win simply by telling Lum I Love You. However, in the end his pride may end up dooming him. So begins the series of events that will at long last decide the future and fate of Ataru and Lum. Swirl Recordings and Film Inc.